In many of the countries we visited once the plane had settled into its' parking space somewhere out on the tarmac they would roll over the stairs to the plane and everyone would descend to be transported to the terminal in a bus. 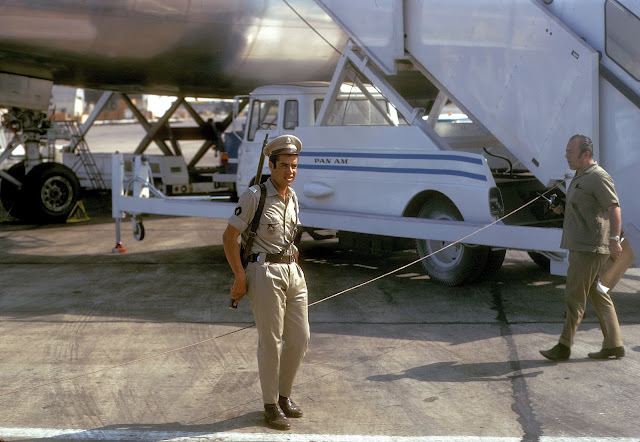 At some airports - Karachi, Tehran, Beirut - before the cabin doors where opened they would send out guards to watch over the plane. At one airport I remember a ring of soldiers facing outwards and spaced a few feet apart entirely circling the plane. For a kid, that seems exciting but I am sure to some of the adults coming down the stairs from one of these Jumbos seeing that type of welcome was possibly unsettling. This guy seems a little more relaxed and isn't typical of what I recall about some of the guards I saw in other locations. I think PND Senior probably took this image because officers with guns mingling with civies was for us still unusual. Times have changed. This is a great full page spread in the Blurb book I am always mentioning.